What’s more, these are only the results of JLR’s operating subsidiaries, which don’t fully capture the cost of the colossal debt Tata Motors has incurred to acquire the company and keep it running. JLR’s profit statement puts interest costs at £10 million, while Tata Motors’ total interest costs stood at Rs559 crore last quarter. In many ways, what JLR’s profit and loss statement shows is but a mirage. This is not to say that JLR’s performance hasn’t improved at all. Since early this year, the luxury car maker has been busy cutting inventory with dealers owing to the slowdown in retail sales. Its wholesale volumes (that is sales to dealers) were 30% and 24% lower compared with retail sales volumes in the March and June quarters, respectively. As a result, inventory with itself and with dealers corrected from as high as 162 days sales at the end of December 2008 to 102 days by end-June. With inventories having corrected substantially, the company has resumed wholesale sales at levels that are close to retail sales volumes. In the September quarter, sales to dealers rose by 23% compared with the June quarter. This would have involved a rise in production, leading to better absorption of fixed costs and hence better profit margins. According to the company management, JLR also benefited from cost-cutting measures. But an analyst with a foreign brokerage says that the improvement in margins seems to be primarily because of the benefit of higher production. He adds that when inventory was high earlier in the year, the company may well have indulged dealers with more discounts, which could now be withdrawn. For margins to improve further, however, retail sales need to grow. Unfortunately, these have been stagnant for the past four quarters. 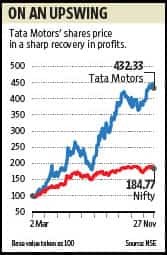 Tata Motors’ shares have run up sharply in anticipation of JLR’s return to profit. Some market participants may be enthused to see it actually happen. But the fact that cash burn continues means that the company may need to continue tapping the markets to raise funds, which can be value destructive for existing stakeholders.